The world of work is changing. As we abandon our desktops in favour of cable-free smartphones and tablets office layouts have become more fluid. Our literal attachment to our desks has waned and modern office furniture, well it’s designed to be mobile. Everything lends itself to swift, easy office reconfiguration. Everything except… Large Plants. How can these statuesque heavyweights adapt to the modern office manager’s need for flexibility? Office plants have proven impact. The bigger they are, the greater their presence, the more their power to impress and inspire is amplified. Combine large plants with sculptural planters and you signal confidence, poise, permanence. In a sealed, homogenous open plan office they add warmth, personality and creative distraction. But, when it comes to rearranging your floor plan, boy can they be the elephants in the room. 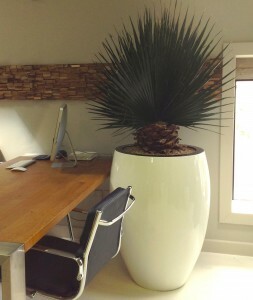 When you want to change things around fast, fast, fast your big office plants can cease to appear so fabulous. In a room where everything else is designed for manoeuverability the large office plant can be a log jam. All the elements – tree, roots, container, soil, water – can weigh in at 100kg+. Not the easiest thing in the world to shift, especially when you add the challenge of getting a grip on a sleek, spherical planter. At the risk of someone slipping a disk, ‘uprooting’ a regular large plant from its current location may require calling in the removal experts. Your typical large office plants lack mobility, making them ill-equipped for the fast-evolving, constantly morphing modern office. When you change layouts, you want your plants to move in tandem. Effortlessly. Injury-risk free. By choosing Mummie Plants you make this possible. Mummie Plants are about adapting regular plants to make them more business-friendly. One beauty of our large preserved plants is that they give you all the visual and sensory impact of an everyday plant for a fraction of the weight. Most of a regular plant’s heaviness stems from its water supply needs. The larger the plant, the more space its root needs, the more soil, the more water, the bigger, heavier pot. It all adds up. Preserving a plant subtracts the water system. Meaning your large plant no longer needs water. Meaning you cut roots, soil and heavier, waterproofed planters from the equation. What you get is a supremely portable plant that’s “even better than the real thing” displayed in a featherlight, foam-packed planter. A regular version of the Washingtonia & Planter shown here can weigh anything from 150 – 300kg (depending on whether a secondary pot-within-pot is used) – You’ve got a workout on your hands to move that. Prefer not to risk straining your back? This Mummie Plant Washingtonia & Planter weighs a mere 20kg. Designed for your comfort and convenience, you can reposition it at your leisure. Finally, you can enjoy the presence of large plants without them ever being a burden. Mummie Plants work with you, not against you, when you have a flexible office layout that needs regular updating. You get all the personality of large-scale live plants but save yourself all the portability problems. 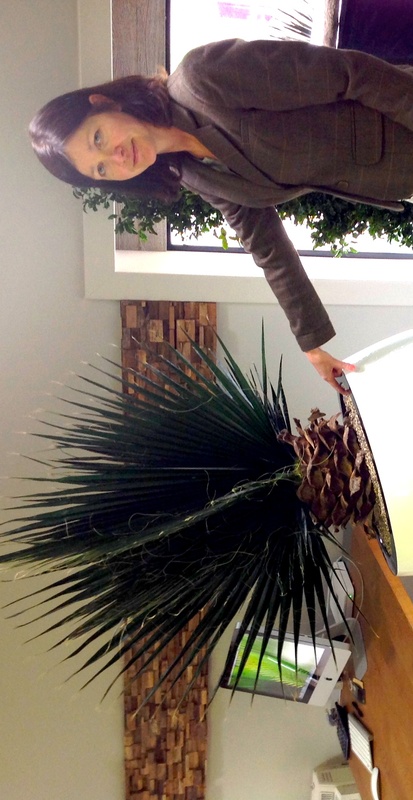 So feel free to “Think Big” next time you are considering new office plants. For advice call Norma at 01 296 4540.